This is the blog site of Leabank Square. It is for everyone who lives in Leabank Square to chat about the amazing neighbours, great gardens, wonderful Lea River - and best of all.... the best community spirit! We were very privileged to have Tim Webb – the Royal Society for Protection of Birds’ Communications Person (http://www.rspb.org.uk/community/members/profile.aspx?UserID=152336) have visit Leabank Square this morning. He was very impressed with what everyone’s done with the Purple Garden – and even more happy with its attractiveness to birds. He gave us brilliant advice about the swans, coots & he even discovered that heaps of the House Martins are actually nesting right here in Leabank Square – as well as next to in Gainsborough School. Tim left some very useful leaflets about gardening in a way that lets nature deal with any pests you may have – so please shout if you want one. Thanks for the visit Tim – you’re welcome back anytime! Excellent news Nadira. It's great to have friends in high places. Did you tell him about the vandals attacking the swans? Did the police get back to you by the way? Great to have him on side. The more we get people like Tim down to LBS, the more it validates the work we do here. How many other estates have got a gardening team trying to make things a lot better for everyone else? This visit was probably a very special request from you guys in LBS, so I suppose if we in Wick Village asked the same, Tim would pop down here as well? I'm sure the RSPB get zillions of such requests, and it was really nice of Tim to come down and chat, so thanks for passing on his advice. Aren't these house martins just the ticket for this years annual mozzie fest?! This blogsite is for all of us. We all love Leabank Square - and want to see our lives here improve day by day. By contributing to this blog we will all feel as if we have a say in how we want our square to be. - how about we all use it to make our lives a lot more positive?! How about we all use it to organise litter pick-up days, or comunal barbeques in the middle of the square, or meetings to get the management company to change something? Please, please, PLEEEEEZZZZZZ feel free to add comment (by simply clicking on the 'comment' tab at the end of each section), share news, show photos, invite neighbours, etc to this blogsite. Let's get communicating!! Please feel free to submit any topics for blogging, interesting pics, exciting videos, local gossip, delicious recipes, handy hints, puzzling queries, relevant links or just to find out more. Simply add our adress to your adress book - and if anything comes up - email straight away. I know that many of us are happy to simply comment on some of these blogs. Then some of us are also happy to send some pics & topics for blogs to the leabanksquare@london.com email adress. 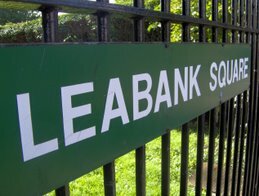 But if anyone is interrested in discussing any subject at much greater length & detail - then please follow the link to the Leabank Square forum site. You can either open up a completely new topic - or add your thoughts to an existing topic. This way we can all get more off our chests, discuss new ideas, get to know each other a lot better - and generally improve all aspects of Leabank Square by chatting about any thoughts we may have!! Is This The End Of Standing On Long-Distance Trains? What are the Benefits of a Garage Floor Coating? Should Hackney politicians have serious views on the supernatural? Beecholme & Environs - architectural and visual. Fantastic Stour Space Designers Market! ......then please email leabanksquare@london.com with their details. Please make sure that you REALLY trust them - as you are going to be recommending them to the rest of your neighbours here in Leabank Square!! I'll kick it all off with a great ELECTRICIAN called Charlie! He lives right here amongst us in Leabank Square - and in fact has done quite a few excellent jobs for some of us already! I can't recommend him highly enough for quality of work & price!! Call Charlie Herbert on 07958 605364. Please click on this link to hear Hackney's very own radio station. It's brilliant!! Leabank Square Swans - Are Family!!!! Be Part of Hackney Wicks Future! !